Boston String Players is a 17-musician ensemble known for bringing contemporary twists to classical music. A classical concert featuring 17 string players, an up-and-coming electronic jazz musician, a choreographer, and an Icelandic singer deified by the indie scene—“Bach to Björk” was another typically unorthodox performance for Boston String Players and conductor and artistic director Motoki Tanaka. Under Tanaka, the group has been known for adding a contemporary twist to the deeply entrenched traditions of classical music. Despite mild weaknesses in the string players’ performances as well as the collaborating artists’ contributions, the “Bach to Björk” concert held Friday at the Museum of Fine Arts succeeded in that it united a diverse range of pieces from 1721 to 1997 and pushed to fuse them with other, unexpected media. The first two movements of the divertimento were cleanly executed and featured Boston String Players’ ability to blend the timbres of their instruments to create a deep, resonant tone. The third movement, however, was the emotive climax of the entire concert. From the quick call and responses of the rondo to the brilliantly rhapsodic solos of concertmaster Lilit Hartunian, the piece came to life as the performers went beyond what was on the page as they alternated between passages of gentle lilting and fiery intensity. The ensemble’s integration of different media, though often engaging, did at one point hamper the overall effectiveness of a piece: one of the more disappointing performances on the program was of Benjamin Britten’s “Simple Symphony,” which suffered from its coupling with opaque choreography by dancer Andrea Higgins. The program notes reveal that the choreography was modeled after the role and gestures of an orchestral conductor, but onstage, the dance was unconvincing and difficult to interpret. Sometimes, Higgins’ movements would be completely counter to those of Tanaka conducting behind her, such as in the Britten’s lyrical and beautiful third movement, during which the quick, abrupt swings of Higgins’ limbs seemed to have come from a caricature of orchestra conducting rather than inspired by the music itself. Ultimately, neither did Higgins’ choreography further the piece’s emotional effect, nor did it provide a coherent—let alone compelling—new interpretation. But the concert’s greatest strength was the performers’ other, more successful attempts to create a coherent synergy among different media, as in the ensemble’s final piece, an arrangement of Björk’s “Unravel” by Boston-based electronic and jazz musician Chadley. For this performance, the premiere of the arrangement, Chadley himself appeared on stage to play the electronics, and a video by musician and performing visual artist Christopher Saunders was displayed behind the performers. Chadley’s arrangement of “Unravel” opened with a single note—a high G on the synthesizer—and eventually developed into an astonishingly complex acoustic-electric mélange in 17 string parts. The arrangement brought a new life to the 15-year-old track, maintaining the same beautiful intricacy of sound while exploring a completely different instrumentation, and the string players’ performance did justice to the arranger’s innovative work. 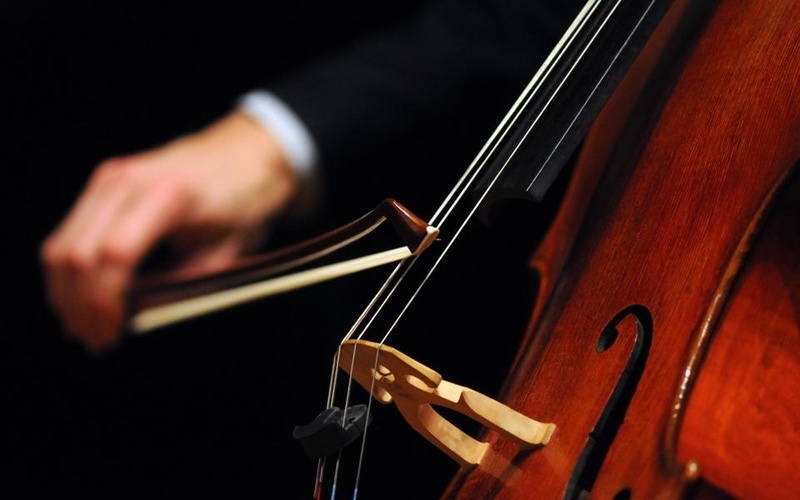 Despite how difficult it is to create a cohesive sound using both acoustic and electronic instruments, especially in a live setting, the string players created a balanced sound through careful knowledge of their role in the instrumentation. And here, the integration of non-musical media helped the piece—Saunders’ video accompaniment, which featured abstract geometric shapes that grew and faded in response to the music, created an enrapturing atmosphere fitting to the work’s contemplative tone. As the last piece closed, what remained was a sense that the concert hardly dragged under the weight of its titanic concept—a fusion of 300 years’ and four countries’ music alongside multiple supplementary media—and remained cohesive in its execution. Boston String Players put together a concert that not only incorporated the time-tested traditions of classical music but also stretched the boundaries of musical performance—two ideas that rarely go together, but in the hands of Tanaka and his musicians formed an inseparable connection. —Staff writer Se-Ho B. Kim can be reached at sehokim@college.harvard.edu.